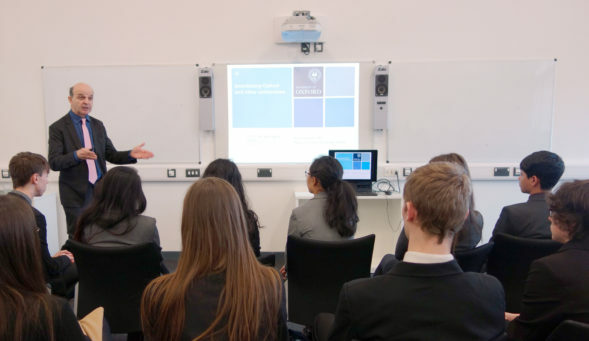 Aspiring Oxbridge and Russell Group students from the Landau Forte academies have received a boost towards their university applications after taking part in a workshop with a University of Oxford Master. Mark Damazer CBE is the Master of St Peter’s College, Oxford, and a former Controller of BBC Radio 4. He was educated at Cambridge and Harvard Universities. 48 students from Tamworth Sixth Form, Landau Forte College Derby and Landau Forte Academy QEMS joined up for the event. At the workshop, Mr Damazer talked students through the UK university system, his love of history, and the importance of humility and learning from mistakes. The Landau Forte students asked Mr Damazer about the transition from sixth form to university, the significance of taking part in a broad range of activities and what to look for when choosing a university. He encouraged students to not be afraid to aim for the best universities in the country and shared ideas for extra reading that could help them achieve this. Mr Damazer also said that Landau Forte students who have attended Oxford in recent years have been excellent to work with. Also in attendance was property developer and investor Martin Landau, who founded the Landau Forte Charitable Trust with Lord Forte in 1989 and sponsored the workshop.